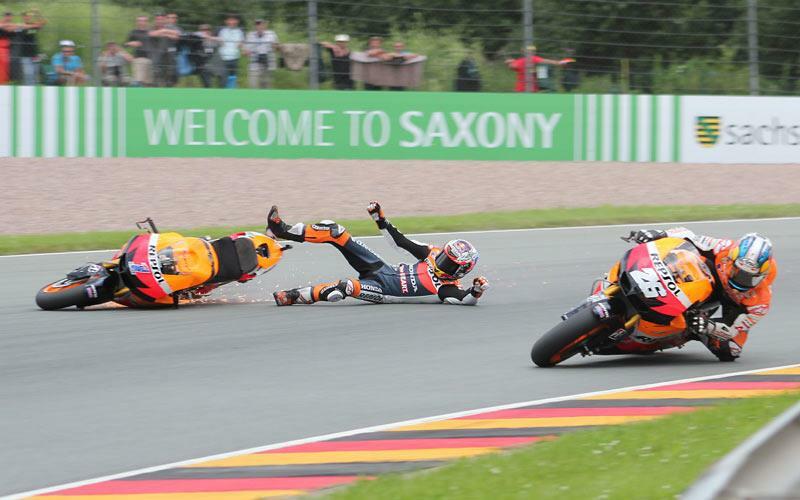 Casey Stoner blew a golden chance to seize the outright lead in the MotoGP world championship yesterday when he crashed out of contention for victory at Germany’s Sachsenring track on the final lap. The Australian was bracing himself for a last corner attack on Repsol Honda team-mate Dani Pedrosa but he lost the front of his factory RC213V machine two corners from the end of the 30-lap clash. Frustrated to have blown a great opportunity to move at least four-points clear of title rival Jorge Lorenzo, the 26-year-old was also unhappy that trackside marshals offered no assistance to get him back in the race. The mistake dropped Stoner back to third in the points standings and with factory Yamaha rival Lorenzo securing second spot, the Spaniard now has a 20-point advantage over the reigning world champion. Stoner said: “At the beginning when Dani was behind me I just wanted to control the race and make sure the tyres lasted. I just wanted to save the tyres and I was pretty happy even when Dani passed me. "As soon as he came by I made a little mistake but I still knew I was at least a few tenths faster than Dani in a couple of points and a couple of points where he was a bit faster. Going into the last lap I made a small mistake at the first corner and lost a bit of ground but I felt comfortable behind him. "I knew I wasn’t going to be able to pass at the bottom of the hill so I just wanted to turn the bike in underneath and get a good run up to the last corner and that’s where I was confident I could make a pass. Stoner said his bike only suffered minor damage and that had he been given help by marshals he could have re-joined the race and salvaged some points. It is the second time in just over a year that he has blasted marshals. When he was taken out by Valentino Rossi at Jerez last season, he claimed marshals offered more help to Rossi. Stoner brushed off the loss of at least 20-points in his bid to successfully defend his MotoGP crown and he said: “We didn't deserve to take so many points back at Assen, but the same thing happened to me at Jerez last year. "We have to keep going forward. Myself and Dani showed we had a huge pace advantage at this circuit. Dani's always been fast here but to be honest I was confident I had the edge over him. I just made a slight mistake and got caught out by something I wasn’t expecting. "What I am annoyed about for the championship is I could have got going and maybe got a few points but they wouldn't help me at all. It is my first crash in a race in a long because of my mistake. "I'm a little disappointed but I know I had the pace and if I have this pace for the rest of the season then I shouldn't be so worried for the championship." For full coverage of the Sachsenring MotoGP, see the July 11 issue of Motor Cycle News.